Born Nicolas Coppola in Long Beach, Calif. on January 7 1964 he is the youngest of three sons of Joy Vogelsang, a dancer and chereographer and August Coppola, then a literature professor at California State University and later Dean of Creative Arts at San Francisco State University. Cage's mother fought a long battle with severe clinical depression, which may in fact have been schizophrenia. Because of his wife's illness, August Coppola took primary responsibility for raising his sons. The Coppolas divorced when Nicolas was 12 and he wound up shuttling between his father's home in Los Angeles and during the summer, those relatives in Nothern California, including his director uncle, Francis Ford Coppola. Largely to escape the family tumult around him, Cage began fantasizing and playacting at an early age. He spent hours imagining himself as a comic book character, putting on puppet shows, and making home monster movies with his brothers. Cage first realised the power of acting in the fourth grade when he used it to stop a bully from picking on him. He slicked back his hair, put on sunglasses and different clothes and pretended to be his own older, more ferocious cousin.Inspired in part by James Dean's performance in East of Eden, Cage attended an acting class when he was 14, then a summer course at American Conservatory Theater in San Francisco. Acting soon won out over studies, and he dropped out og high school before graduation despite passing his GED equivalency exam. His first atcing job was a part in a TV series, The Best of Times which was never picked up by a network. His first film was 1982's Fast Times at Ridgemont High which his part almost ended up on the cutting room. After taunts on the set from other actors who thought he was getting parts only because of his famous last name, he decided to change it then and there. When he auditioned for 1983's Valley Girl an actor named Nicolas Cage was born. He took his new last name from an African American comic book hero named Luke Cage. Valley Girl proved to be just the right mix for the fledgling actor, from there his roles multiplied. He played Kathleen Turner's boyfriend and husband in his uncle's time-travel comedy, Peggy Sue Got Married, was casted as Cher's lover in Moonstruck, won critical acclaim in the black comedy, Raising Arizona and excelled in the offbeat part of an Elvis-worshipping-drifter in Wild At Heart. Though the critics loved those quirky characters, Cage made a conscious decision to expand his repertoire and followed with the light comedies, Honeymoon in Vegas,It Could Happen to You and Guarding Tess. With his career on the fast track, Cage's personal life evolved as well; he had a son with his former girlfriend, Kristina Fulton in 1990 and later married actress Patricia Arquette in 1995. His acting career hit a hign-note when he won best actor honours at the Oscars in 1995 for his portrayal of a self-destructive alcoholic in Mike Figgis' doomed love story, Leaving Las Vegas. With an Oscar under his belt, Cage was determined to make his name with a wider region of audiences and he knew that the best way was through action movies. After a steady role opposite Sean Connery in The Rock, he finally proved his action creditials in Simon West's Con Air. His protrayal of a convict with a heart of gold although no stretch for the versatile actor finally seal his status in the Hollywood A-list. 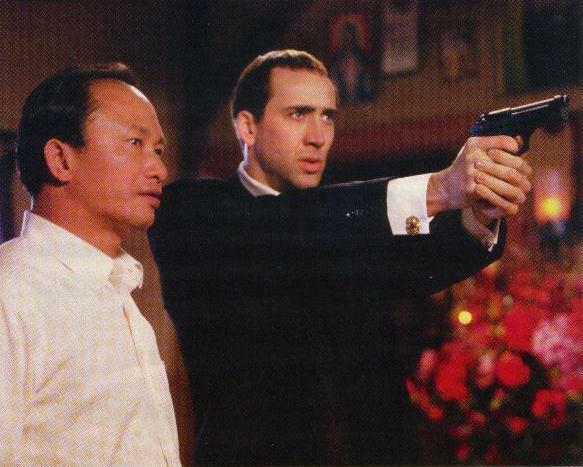 In 1996, Nicolas Cage joins John Travolta to work in John Woo's Face/Off which was probably Cage's final supporting role to date. Nicolas has since continued to cater to mainstream audiences with his box-office hits like Snake Eyes,City of Angels and 8MM. In 1999 he finally decided to do more than just "popcorn movies" when he starred opposite his wife in Martin Scorcese's Bringing Out The Dead. The film although no box-office success, re-confirmed the talents of two Hollywood stars, Nicolas Cage himself and director Martin Scorcese as both were starting to drift from their hey-days. Last summer (2000), Cage return to entertain mainstream audiences in the popcorn action affair,Gone in 60 Seconds and will be seen this Christmas in Family Man. Next up for Cage is his second collaboration with John Woo in the war epic Windtalkers.